Balls promote positive interaction and teamwork. They are an excellent physical and emotional outlet for kids and adults alike and bring tons of joy and levity to the community. 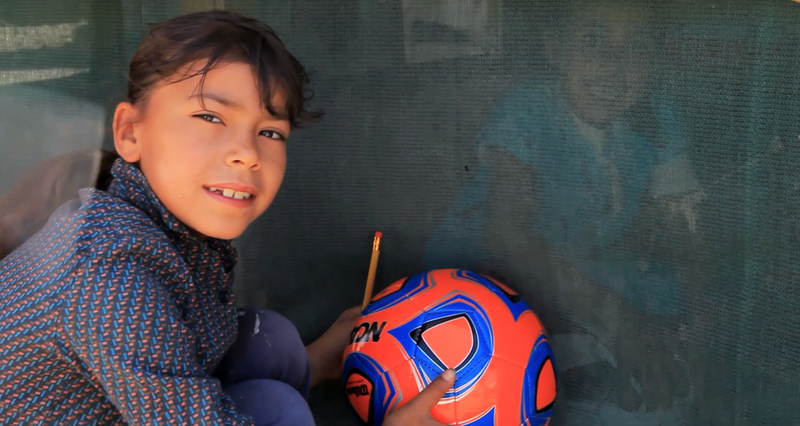 As an added benefit, the children around the world who donate the balls (yes, all our soccer balls are donated by school groups, soccer clubs, girl scouts, etc) learn about the lives of their peers living as refugees and they are able to develop a deeper understanding of the world and their place in it. In other words, in the best case scenario, they form a connection to their fellow humans that goes deeper than the news headlines. We always need soccer balls so if you would like to arrange a drive in your school or community, please contact us via e-mail for specific details. Soccer balls donated by: Troop 144 - Farthest North Girl Scout Council, Alaska; Caleb Sizemore; Josh Slocomb and Signal Hill School; Christ School; Olga Mahoney; ABYSSA; Tate McQueen; Coach Gladys; Coach Feist; AC Reynolds Womens Soccer Champions - The Rockets; Owens High School; The Learning Community School; Jubilee! Community.... and many, many other individuals, groups and teams! Summer 2018: HADAYA ambassador and high school student, Justice Ajogbor, traveled back to his native Nigeria and delivered dozens of soccer balls to several hundred children at the Internally Displaced People's Camp (IDP) in Benin City, Nigeria. There are 3000 women and children in the camp, most of whom have fled the vicious onslaught of Boko Haram in the Northeastern part of the country. Soccer balls were donated by the girls of Troop 144 - Farthest North Girl Scout Council from Fairbanks, Alaska.